Why entrepreneurs succeed in some cases when others don’t is not just a matter of being smarter but also being persistent. A look at what motivates entrepreneurs to keep going. As long as consumers have problems, they will always look for solutions; solutions that offer them better, faster and smarter ways to solve the problems of everyday life. This is where the role of an entrepreneur comes in. Path breaking products and solutions that make users’ lives easier or richer, are the essence of entrepreneurship. Yet, the truth is also that many businesses flounder, and some of these will have to give up. So what motivates these people? What is the driving force that pushes them beyond the safe frontiers of the known into the unknown? The path to success is etched with the steps of failure. We fret over them, try to avoid it, and question ourselves every time we have unconventional ideas. But the truth is no that great success has ever been achieved without facing failure. 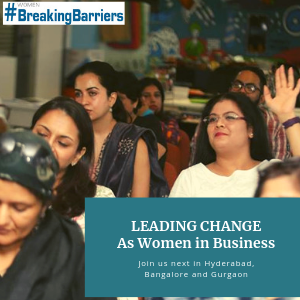 Every inspiring speaker we have at the Women’s Web flagship event, #BreakingBarriers, has a story of failure at some time – the difference is that they refuse to let it stop them trying. “Fear is only as deep as the mind allows!” Entrepreneurship is all about taking risks and walking into the unknown, like Nidhi Agarwal, who launched her own online clothing store, KAARYAH, that offers women the perfect fit with its 18 sizes. She found investors who believed in her business model after being turned down by 113 investors. Nidhi’s success story is one of persistence and courage that stayed put in the face of failure. Entrepreneurship is not just about starting a business; it is about creating solutions for the existing problems that haven’t been addressed. Entrepreneurship means identifying the customer’s needs and providing solutions that not only have a sustainable business model but also a supporting revenue model. This excitement of providing a new solution drives the most creative entrepreneurs. The feeling of contentment that entrepreneurship renders can be extremely fulfilling. But entrepreneurship also means that waiving off responsibility is not an option. It means taking responsibility for every decision and being accountable for it. This can be troublesome when times are tough but extremely satisfying at other times. Entrepreneurship means re-discovering yourself. For some it might mean the change they want to see around them. It might give their life a new purpose. For some the purpose might be greater financial flexibility or stability. For some it might mean bringing a revolutionary change in the society they live in. But one thing that remains constant in every entrepreneurial venture is touching lives and bringing in a noticeable change in people’s lives. If you are an entrepreneur, or considering become one; if you have an entrepreneurial role at a larger organisation, if you work by yourself as a consultant or freelancer – you should join us at inspiring Women’s Web events for women in business. 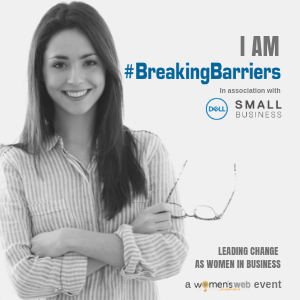 Let’s get #BreakingBarriers! Here’s where you can find details for events in your city, and register for a free pass.